Automation refers to the ability of the program to reach beyond its bounds and affect other things on your computer. Automation events are triggerable by Jupiter predicted events, Jupiter position, or time alone. For example, you could have RJ Pro start a copy of Radio-SkyPipe or some other data collection program whenever Jupiter is above 30 degrees, the Sun is below the horizon, and an Io A or Io B storm is predicted to occur. How does RJ Pro do this? First you must provide a set of parameters which trigger the tasks you wish to occur. This is done via the Automation Parameters screen shown below. This screen can be brought up via the Tools/ Automation menu item or via the Automation Parameters graphical toolbar button on the main screen. At first glance the panel is rather formidable, but it breaks down nicely into manageable pieces. Note that there are two sides to the screen. On the left are the Conditions panels. These are the conditions that must be met to enable the Tasks which are listed on the right side of the screen. Arrows are drawn to remind you which Tasks are affected by which of the conditions panels. For example, the "When Alt Az conditions met ..." task is affected directly by the lowest (gray) condition panel. Tasks are accomplished by using scripts. Scripts are files which contain a list of commands understood by the program. Writing a script is accomplished using the Script Editor. It is a little like programming but not nearly as hard! After you have written a script, you can associate it with one of the three available tasks by pointing to it with the Browse button for that Task. The script will not run unless the Run Script check box is selected. Note there are three Tasks and associated script files which can be designated. The top Task labeled "When conditions are met..." is the task that fires as soon as the associated conditions are met in the top two conditions panels. The next task labeled "When conditions are no longer met..." fires appropriately when the storm is over, or when the Sun rises, for example. As mentioned above, the "When Alt Az conditions met ..." task is affected directly by the lowest (gray) condition panel. The three conditions panels are ranked from top to bottom in order of priority. The top panel is time based. Select GMT or Local to determine if time related conditions are specified in GMT or local time. If Do On This Date is checked, tasks can be run only on the specified date. If Do At This Time is checked, the task will be run at the specified time. Do Daily will allow tasks to occur on any date either at the specified time (when Do At This Time is Checked) or whenever the conditions in the panels below it are met. Note that Do On This Date and Do At This Time can only fire the topmost Task. The dark orange middle conditions panel provides the set of conditions which relate to Jupiter predicted events and position. 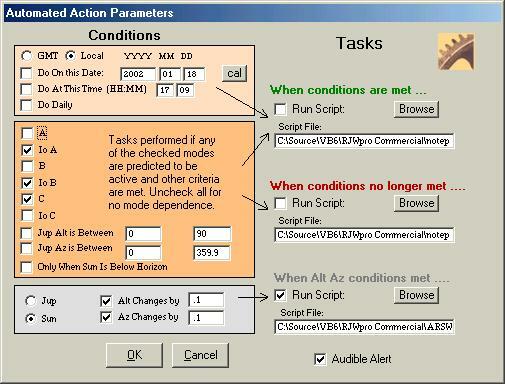 The Jupiter modes check boxes (Io-A, B, etc) operate in an OR manner, that is, when any one of the modes is active the task criteria is met provided the criteria set immediately below in the "Jup Alt is Between", "Jup Az is Between", and "Sun is Below the Horizon" parameters are met. The check box next to each of these three positional parameters must be checked or the parameter is ignored. So if you don't care what Jupiter's azimuth is, simply do not check the box next to "Jup Az is Between". Finally the bottom condition panel (gray) is provided primarily to run a script which adjusts an antenna positioner. Thus, you can fire off a change in the antenna positioner when Jupiter moves by a given angular distance. These conditions also depend on the conditions in the orange condition panel above it to be met before they will fire the associated Task. The "Jup Alt is Between", "Jup Az is Between", and "Sun is Below the Horizon" parameters must be met before the positioner task will fire. If you have any of the modes checked then the positioner will only follow Jupiter when that mode is active also.